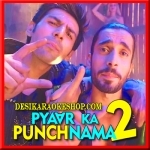 Pyaar Ka Punchnama 2 is a 2015 Hindi film. It is a sequel to the 2011 film Pyaar Ka Punchnama. The sequel is directed by Luv Ranjan and produced by Viacom 18 Motion Pictures and Panorama Studios Production. The film stars Kartik Aaryan as gogo, Omkar Kapoor as Thakur, Sunny Nijar as Chauka, Sonnalli Seygall as Supriya, Ishita Raj Sharma as Kusum andNushrat Bharucha as Chikoo. The film was released on 16 October 2015.